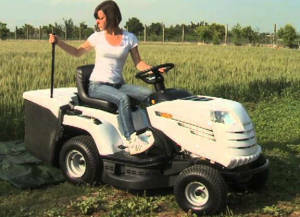 The Alpina AT598 HCB is a sturdy, reliable and versatile lawn tractor designed to be a powerful help for medium to large sized gardens of up to an acre. 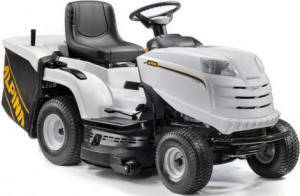 The Alpina AT5 98 HCB lawn tractor is fitted with a large 38 inch wide twin blade cutting deck. The twin cutting blades counter rotate to feed the 240 litre grass collector directly up the middle of the mower, this cutting method leads to less blockages in the chute. This ride on lawnmower is powered by a reliable single cylinder 500cc Briggs & Stratton engine and is driven by a hydrostatic transmission. The hydrostatic transmission allows for effortless control in forward or reverse. You two pedals, one forward and one reverse, the more you press the faster you go. 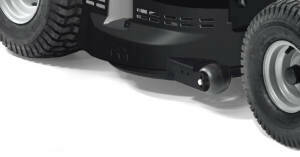 The blades are turned on and off by the push of a button and the large 38 inch cutting deck is fitted with anti-scalp wheels which will ensure a perfect cut. The Alpina AT598HCB can be fitted with an optional mulching plug and tow hitch turning this mower into a year round machine.